I 14:15:27 ImgBurn Version 2.5.8.0 started! I 14:15:28 Found 1 BD-RE! E 14:34:11 Failed to Write Image! I 14:34:11 Export Successfully Completed! If they don't work either, try a different drive. Be sure they aren't Life Series. If they're Life Series, they're some of the worst you can get. 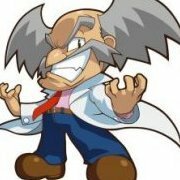 You need DataLife Plus discs you can only find online. Can't tell from that. You'll have to insert one of the discs to find out. 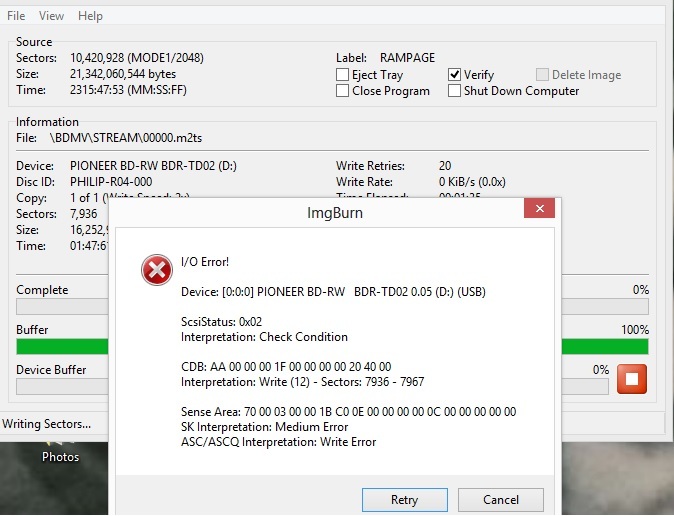 ImgBurn will tell you in Write mode in the right hand side pain something called Disc/Manufacturer ID. If it says VERBAT-IM or some variant, they're good. If they say CMC anywhere in them, they're bad. Right hand side pain?! Obviously, I meant pane. That's not real quality verbatim. That's the lower grade 'outsourced cheap crap' "life series" you find in a retail store. You need the ones with the VERBAT-IMx-000 id. That's the online only and good stuff. Those you got, I bet you won't even make it halfway through the pack / spindle before you have your first burn failure. If not that, good chances your standalone player won't play them. Even if they finish burning and verifying, CMC media generally doesn't last very long. I had some like 15 years ago. After a year, they weren't readable. And this was from a stack of like 200 where half of them failed to burn or verify. 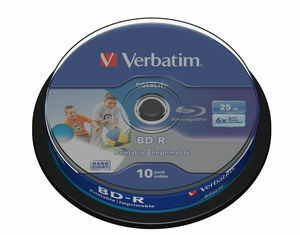 I'm not entirely sure as I've never seen the good Verbatim BD-R is packaging that says DataLifePlus on it. However, those are printable surface media, so that might explain it. I haven't bought any of those in years and am still working on my cake stack of them. If it says DataLifePlus on it and there's a premium on the price, well, there's a reason it probably costs more. It's the good stuff. Those are the printable good ones yes, but got a THERMAL printer only, as in the packaging. The ones for a normal printer say 'wide inkjet printable'. But the packaging like that is correct. Good catch, Ch3! I didn't notice those were thermal printable labels in the image. 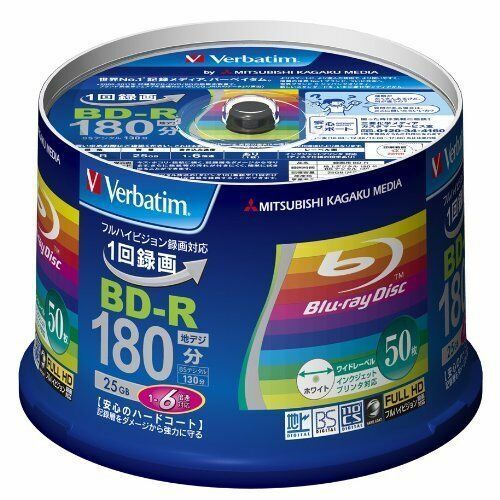 I don't have a CD label printer but I always use the inkjet printable label surface discs to burn to, unless they're intentionally for temporary backups which will be destroyed after their usefulness has ended, discs to give to others, etc. I use them in case I ever do get such a printer, I can print labels on them later. And even if I never do get such a printer, I can always write on them with CD markers to write a title or some other identifying information on the inkjet printable surface. I got the Canon Pixma IP7250 was a lot cheaper then the Epsons and was delivered in a flash too, for cd labels it does the job!